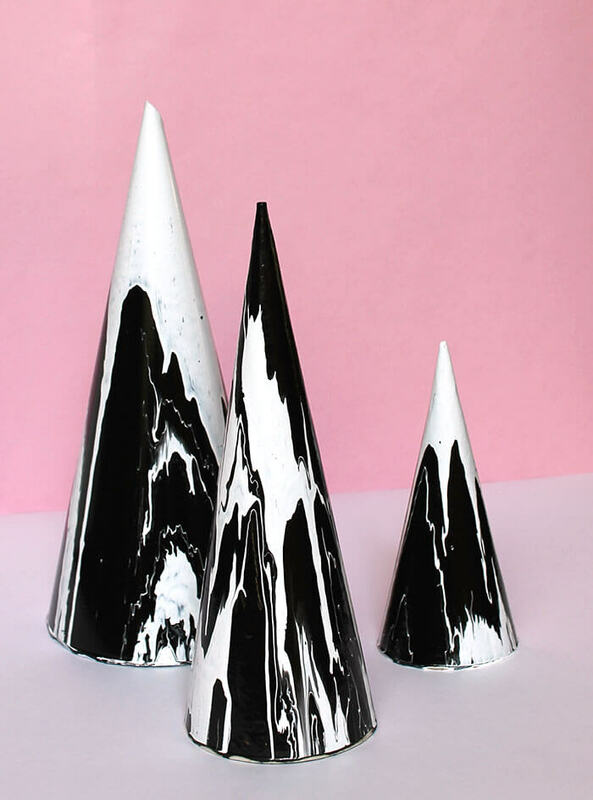 These modern Christmas trees have a glossy, marbled look thanks to a fun paint drip technique. 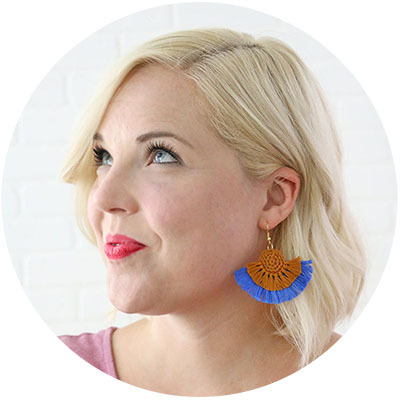 A big thanks to DecoArt for sponsoring this post! This post contains affiliate links for your convenience. You can read my full disclosure policy here. I’m a big fan of the whole marbling trend. I’ve already made a few marbled projects using marbled paper and nail polish marbling, but today I tried out a different technique. 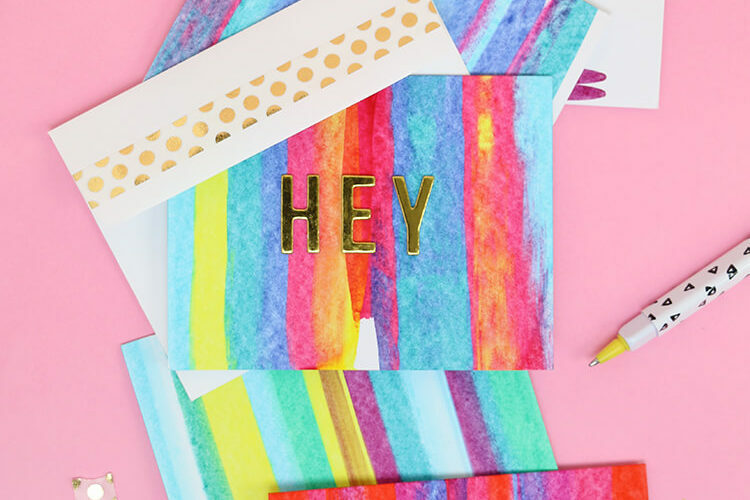 DecoArt sent me some of their new Americana Decor Maxx Gloss paint, and it’s some pretty cool paint, guys. It is super glossy (as you may have guessed) and the paint flows really well so it levels out nicely and creates a really smooth finish. I thought that these qualities would make it the perfect paint for a drip paint project. 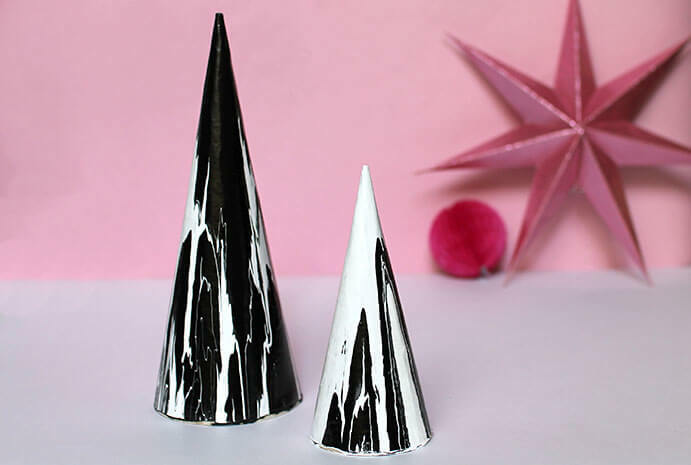 I decided to try out the technique on some cones for a modern take on the Christmas tree, and I’m pretty stoked on the cool marbled look I ended up with. Here’s what you will need to make your own. Americana Decor Maxx Gloss Paint (Patent Leather and White China) available at Michaels (in-store & online), Home Depot (select stores & online), Jo-Ann Fabric & Crafts Stores (in-store & online), and Meijer. This project is really a lot of fun, but it is also really, really messy. You definitely will want to put down a couple layers of plastic to protect your table. 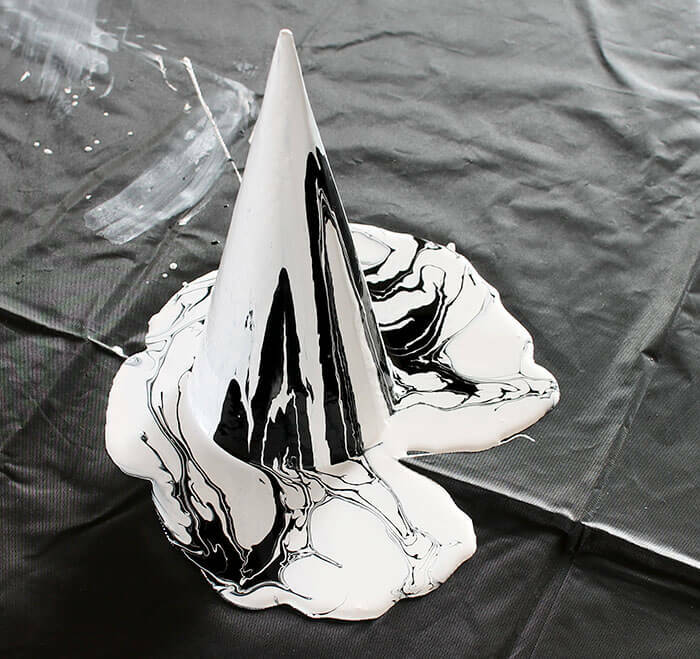 The marbled look is created by pouring small amounts of contrasting colors of paint on the top of the cone and letting the paint run down the sides and swirl together. 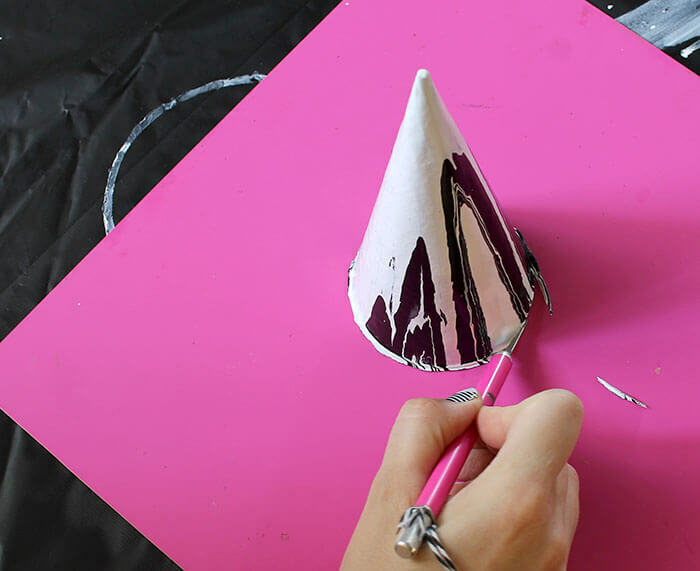 Start out by completely covering the cone in one color of paint to ensure you don’t have gaps without paint any where along the bottom of your cone. 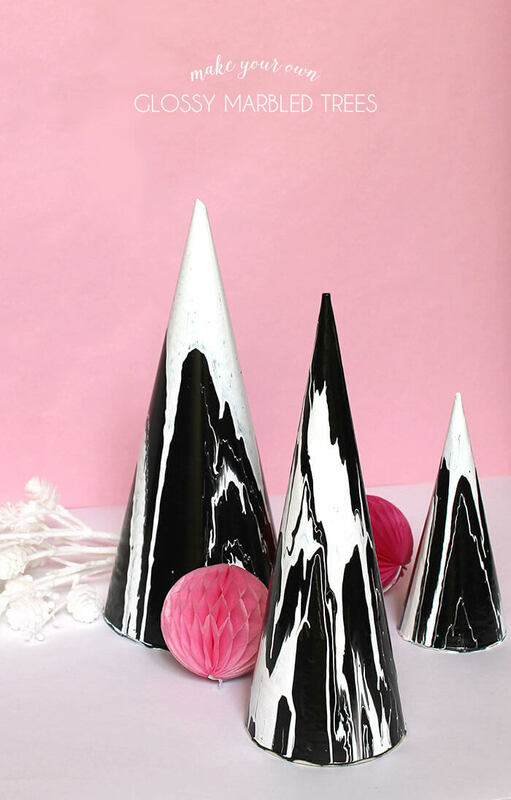 Once the cone is completely covered, use plastic spoons to drop small amounts of paint on the top of the cone. Alternate between colors, and enjoy watching the paint mix, drip, and swirl. Continue adding paint until you like the look. 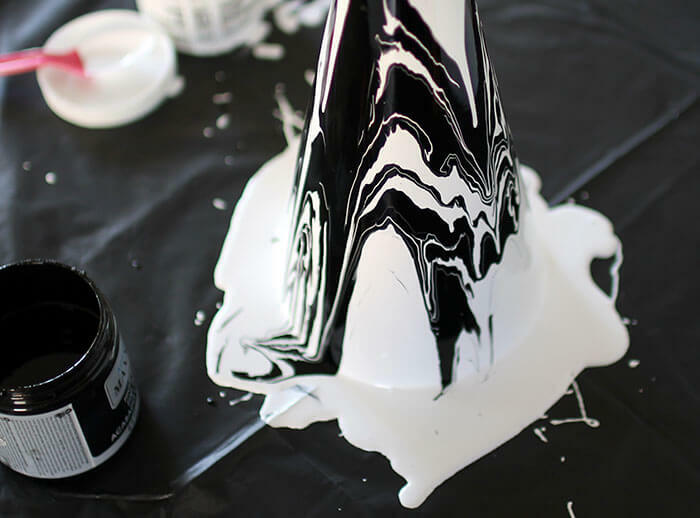 Keep in mind that the paint will continue to slide down the cone, so the look and marbling will change as it moves and dries. A lot of the paint you put on early on will slide right off the cone entirely, and the last drop of paint will slide down quite a bit. You don’t have a ton of control over how the paint will move, so try to just go with it. 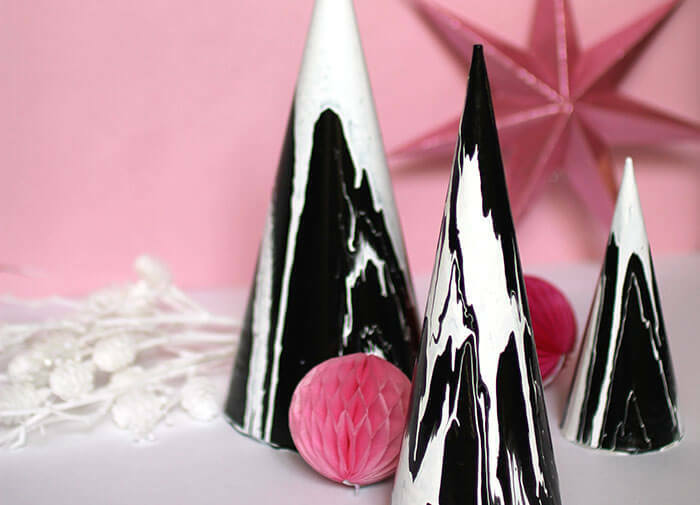 The pools of marbled paint at the base of the cones might be my favorite thing ever. You will need to leave the cone to dry overnight on the plastic. When it is dry, gently pull the cone from the plastic and use a craft knife to trim any excess paint from the base. After that, your marbled trees are all ready to display! I’m trying to figure out what to do with the extra marbled paint that pooled and dried on the plastic. I’m pretty sure it could make something pretty awesome. 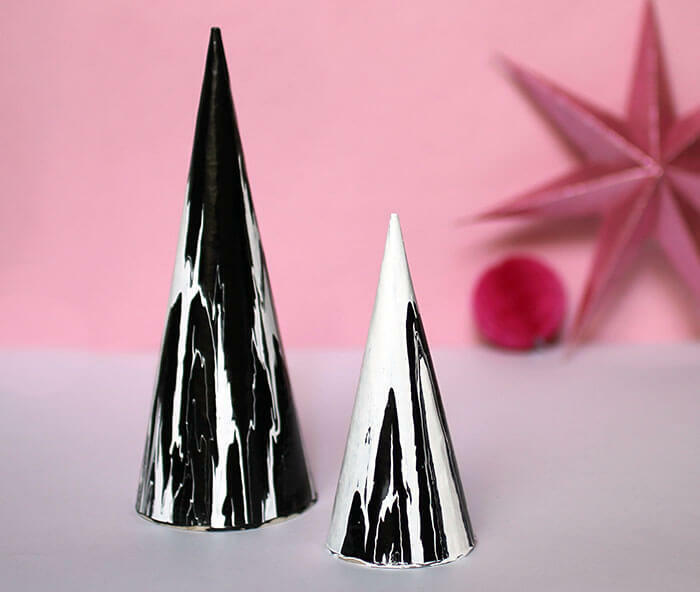 If you make your own marbled trees, I would love to see them! Tag me on instagram or share to my facebook page. Aw thanks so much, Bre! Me too…LOVE the pools!!! There has to be something cool they can be used for! My head is simply buzzing with wonder! 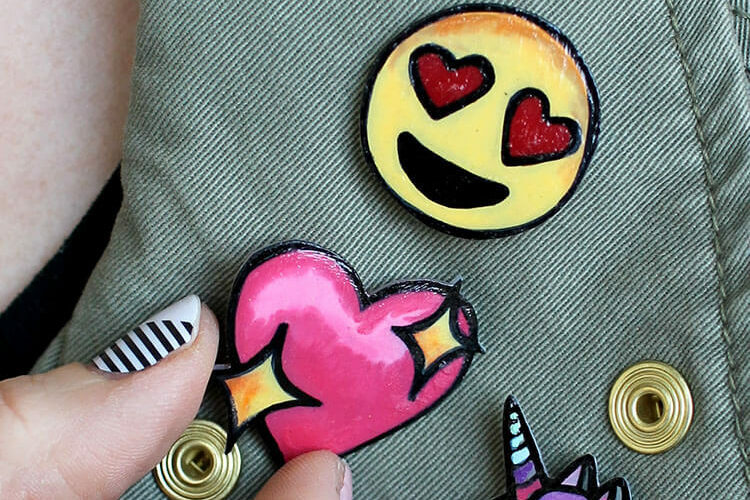 Cut out the paint skins to make jewelry -prndants, earrings, etc. you can use a Spray Varnish or resin them. They are quite pretty ? Well this is super cool. I loved your video, too!! I love these. I’ve never thought of marbling with paint like that. Great idea!